HON. J. A. COMBS, one of the very prominent and widely-known residents of Mulberry Grove, Ill., is a familiar personage in the social and commercial as well as the political circles of Mulberry Grove Township, Bond County, Ill. He is engaged in the real-estate and insurance business, and holds the important office of Police Magistrate, and is also a Notary Public, having held the latter office for nineteen years. Our subject was born in Coles County, Ill., November 2, 1833, near the village of Ashmore. The father of Mr. Combs was John Combs, a man who was well known throughout the State. He was born December 20, 1810, in East Tennessee, and remained in the same locality until he was seventeen years old, when he moved with his parents into Indiana, where they remained for four years. Here the young man began the study of medicine, and when the family removed to Clark County, Ill., he continued his studies and became a practicing physician, and followed his profession until his death, which occurred in Mulberry Grove, July 13, 1851, of cholera. The grandfather of our subject was also a native of East Tennessee, and there conducted a farm until his enlistment in the War of 1812. The mother of our subject was formerly Elizabeth M. Mitchell, who was born in Russell County, Ky., January 3, 1812, and when quite young removed with her parents to the State of Indiana. She came to Coles County, Ill., in 1828, while her death took place in Kansas, in 1866. Her father, John Mitchell, a native of North Carolina, resided near Guilford, where occurred the battle of Guilford Court House. This battle was fought on her grandfather's plantation, and there yet may be found in some of the deep furrows which the plow of the husbandman turns up an occasional bullet which long ago did its deadly work. The family came of that mixture of Scotch-Irish blood which has given the world some of its most eloquent men and lovely women. The parents of our subject reared a family of nine children, only six of whom grew to full maturity, and but five are now living. Of these the gentleman of whom we write is the eldest. His youngest brother, William, became prominent in the State of Kansas, and held the position of Judge of Lyon County from 1888 to 1890. The others of the family have become well and favorably known in the localities where they have lived. Mr. Combs of this notice came into Bond County, Ill., March 1, 1845, and to the town of Mulberry Grove March 2, 1846. His first school days were passed in Marshall, Clark County, Ill., whence he went to the celebrated McKendree College at Lebanon, Ill., to finish his education. He was only nineteen years of age when he began the management of his own affairs, and so determined was he to obtain an education, that he perseveringly worked his own way through a year's course at college. After such a preparation he found teaching a congenial employment, and for six years he followed it. August 21, 1859, he married Martha E. Buchanan, who graced his home but a few short years, when death claimed her for its own. She left three children at the time of her decease: Jennie, now Mrs. Holt, of Pocahontas; Lillie, who finds a home with her sister; and Ernest E., who is a graduate of the college at Valparaiso, Ind., and was elected President of the Alumni, and is now Principal of a school at Sorento, Ill. The second marriage of our subject took place here, and the lady who became Mrs. Combs was Louisa A. Burke, nee Russell, a resident of this town. No children have resulted from this union. Mr. Combs is an ardent Republican and has done much for his party, of which he has been a member since its organization, and in 1869 he was elected to the office of Justice of the Peace and served until 1877; he was re-elected in May, 1891, and has also served one term as School Director. He has been a Notary Public for the past nineteen years, and is the second oldest Notary in the county. His election to the Legislature to represent the district composed of Bond, Clinton and Washington Counties, took place in 1888, and he took an active part in the special session of 1890, when the World's Fair question was under discussion. Mr. Combs served three years in the late war, having enlisted in Company E, Twenty-second Illinois Infantry, and was in all of the principal battles of the war. He came out of the struggle without wounds, but with experiences which have left a lasting influence. His life has been one of business and he has been successful in many ways. Few men attain all of the heights which youth promises, but Mr. Combs has accomplished much more than many of those who started under more favoring circumstances. 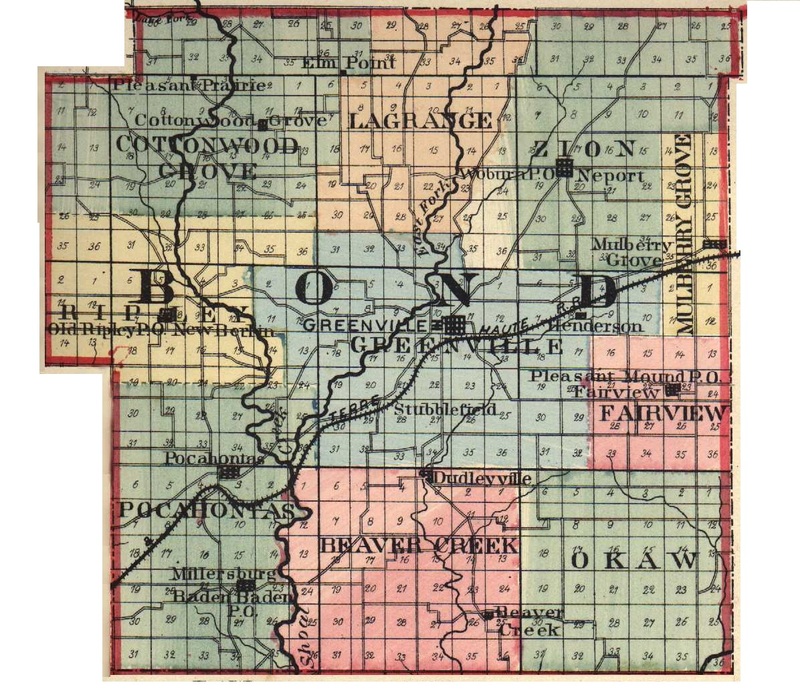 Extracted 04 Dec 2016 by Norma Hass from 1892 Portrait and Biographical Record of Montgomery and Bond Counties, Illinois, pages 235-236.